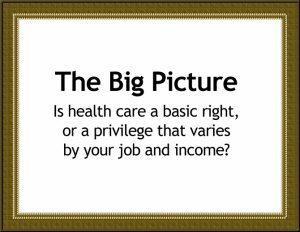 Overview: A person’s economic class affects their health, in both obvious and hidden ways. In the United States, not having enough money to pay for health insurance is a clear health risk. Individuals without health insurance are less likely to have routine physical examinations. They are less likely to know they have high blood pressure, diabetes, high cholesterol or many other serious health problems. Health disparities are rooted in wealth disparities, but there’s more to health than a high income. Countries with a big gap between the haves and the have-nots show poorer health statistics overall than countries in which most people have similar incomes, even if they are modest. Money isn’t often talked about in a doctor’s office, but it should be. 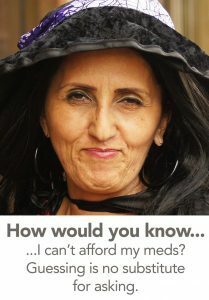 A patient who can’t afford his medicine probably won’t buy it, and probably won’t mention that fact. Asking patients if treatments are affordable is tricky, but necessary. How do we know that being poor is bad for your health? Is income the only way that economic class affects health? I think perhaps my patient can’t afford the treatment I’ve recommended. How do I ask him? Q. How do we know that being poor is bad for your health? A. If you are too poor to afford health insurance, and you do not have access to free care, you are more likely to be unhealthy, according to recent research. The uninsured miss needed medical care, including screenings for early signs of cancer and other illnesses. Q. Is income the only way that economic class affects health? A. No, definitely not. For example, researchers using data collected in the Black Women’s Health Study, a prospective follow-up study of 59,000 black women, found that median housing value was inversely associated with hypertension, but was independent of income level or of individual risk factors such as weight and physical inactivity. In other words, simply living in a poor neighborhood increases the likelihood of hypertension for black women. Q. I think perhaps my patient can’t afford the treatment I’ve recommended. How do I ask him? A. It may be best to be indirect; people are often ashamed about being unable to afford health care. But don’t avoid the subject. Most patients would welcome a chance to save money on health care, if offered diplomatically. You could start with a question about whether the patient might prefer a generic brand rather than the name brand of the treatment prescribed. Association of Clinicians for the Underserved: Nonprofit, transdisciplinary group to improve the health of America’s underserved populations and enhance the development and support of the health care clinicians serving these populations. Socioeconomic Status and Health: A still-timely 2008 examination led by Harvard University’s David Cutler on how income status influences health. Health, Income and Inequality: A report from the National Bureau of Economic Research that puts meat on the bones of this simple truth — “Richer, better-educated people live longer than poorer, less-educated people. Children — Socioeconomic Class and Equity: An analysis and recommendations from the National Association for the Education of Young Children that “seeks to increase the visibility of equity issues and to encourage discussion of this important aspect of families’ and children’s lives.” This article also offers classroom suggestions for educators. Bridge to Benefits: An online program that helps families find out about and apply for Food Support, school meal programs, health care programs, energy assistance, child care assistance and the Earned Income Tax Credit. Produced by the Minnesota Children’s Defense Fund. Advancing Community Health Worker Practice and Utilization: The Minnesota CHW Alliance website provides a deep well of information on definitions of the field, training options, and research on efficacy of CHW interventions.